Aggravated Assault is used by the Police when an assault takes place in 'aggravated' circumstances such as when another person is present, or when kicking or a weapon is used. You get into an argument at a bar. You threateningly swing a pool cue at the other person and make contact with their leg. You are confronted by two security guards in a shopping centre. You wave a knife at them to threaten them. In one case, one of our clients was charged with 13 violent offences involving family violence and including Aggravated Assault. Our client wanted to plead guilty, so we helped him with his plea. After our discussions with the prosecution, our client pleaded guilty to 5 of the original 13 charges. The Magistrate imposed a fine without conviction. Another of our clients was charged with several serious assault charges, including Aggravated Assault with a bat. We highlighted that our client was not involved in an extended episode of violence, that he had no criminal record and strenuous parenting responsibilities, and that he was remorseful. After discussions, the prosecution agreed to withdraw the original charges and our client entered a guilty plea to a charge of recklessly causing injury. He was fined without conviction. What are possible defences to an Aggravated Assault charge? Somebody else assaulted the victim. 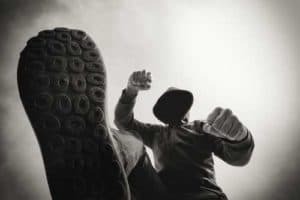 You kicked someone or used a weapon in self defence. How can they prove the assault and aggravated circumstances? Were you acting in self defence? The maximum penalty for this offence is imprisonment for 2 years. Aggravated Assault is a charge which is generally heard in the Magistrates Court. "Were you acting in self defence?" What is the legal definition of Aggravated Assault? There are 2 kinds of Aggravated Assault in Victoria. The first is when either a female, or a male under the age of 14, is assaulted. If a Magistrate thinks that the punishment for assault is too lenient in the circumstances, the Magistrate may hold that the assault is aggravated. The Second kind of Aggravated Assault is assault done by more than one person, or by kicking or using a weapon. The section that covers this offence is section 24 of the Summary Offences Act 1966. The accused committed assault or battery of such an aggravated nature (in the opinion of the court) that it cannot sufficiently be punished under the section for Common Assault. A serious aggravated assault may mean you go to jail. Less serious incidents may mean a range of penalties from a fine to a Community Correction Order. From July 2011 to June 2016, there were a total of 129 charges of section 24(2) Aggravated Assault - In Company or Kicking or Weapon/Instrument that were heard in Victoria's higher courts. The majority of these charges led to imprisonment (57.4%) . Other sentences include: Youth Justice Centre Order (15.5%), Community Correction Order (14.0%), Wholly Suspended Sentence (6.2%), and Fine (4.6%). Of those sentenced to imprisonment the majority (82.4%) received a term of more than 1 but less than 2 years. The same period of time was also imposed to majority of those who were sentenced to Youth Justice Centre Order (50.0%) and Community Corrections Order (55.6%). Of the charges that led to Community Correction Orders, 50.0% (non-aggregate) were for a term somewhere between 12 and 18 months. The longest term imposed was more than 24 months (4.2%). The majority of the charges that led to CCO were sentenced to a term that was between 12 and 18 months (non-aggregate, applied in 54.5% of the charges that led to CCO). The highest term imposed was more than 2 years (5.9%, non-aggregate). Sentencing Advisory Council. "SAC Statistics - Summary Offences Act 1966 (Vic): s 24(1) - aggravated assault - male 14 or under, or any female, or aggravated nature." SentencingCouncil.vic.gov.au. https://www.sentencingcouncil.vic.gov.au/sacstat/magistrates_court/7405_24_1.html (accessed February 11, 2019). SAC Statistics - Summary Offences Act 1966 (Vic): s 24(2) - aggravated assault - in company or kicking or weapon/instrument." SentencingCouncil.vic.gov.au. https://www.sentencingcouncil.vic.gov.au/sacstat/magistrates_court/7405_24_2.html (accessed February 11, 2019).